Polldaddy is one of the most well-known and respected online survey software solutions that can help you to easily create, manage and distribute professionally made surveys, pools and quizzes in minutes. With years of experience in online productivity, team that brought you worldwide known WordPress.com now gives you the ability not only to use Polldaddy as an editor of fantastic looking survey presentations, but also chance to embed them on your sites with as little trouble as possible. Amazing online survey software! Polldaddy is a service that can be used not only for business, marketing, consumer surveys, and audience testing purposes, but it can also be an excellent tool for teachers to test their student with pop quizzes, gather feedback on field trips, organize events, and all in all enable much easier flow of communication between teachers and students. Planning birthdays, weddings, and other gatherings will become much easier if you can easily communicate with attendees and quickly find out their preferred dates, favorite foods and much more. Polldaddy will gather all the information that was gathered from people who interacted with your surveys, and present the data in easy to use and powerful reports that can be exported to Excel, Google docs and many other file formats of your choice. Easily create professionals polls and surveys! Pools and surveys are very effective ways of discovering the true state of your community, user base or general internet users. However creating those polls, sending them out, promoting them, receiving data and finding meaningful reports of out that data is something many people, organizations and businesses are struggling with. Thankfully, poll and survey management has become much easier with the dedicated web services that will take the bulk of job away from you and make your poll management as easy as possible. First place on the web that you need to visit of you are interested in professional solutions for polls, surveys and quizzes is Polldaddy, a service that was created in 2006 by David Lenehan and which today represents incredible tool for anyone who wants to not only easily manage their polls and returned data, but also integrate them into web pages as embeds or widgets, easily collecting data even from the unsuspecting users. Polldaddyis one of the most popular services for creating online polls not only for use by individuals, but also scaled up to the most complicated projects done in educational organizations, governments and large multi-national corporate marketing projects. This all is supported inside very well organized package of tools and services that can be easily learned to be used even by people who have very little technical knowledge or knowledge in design. 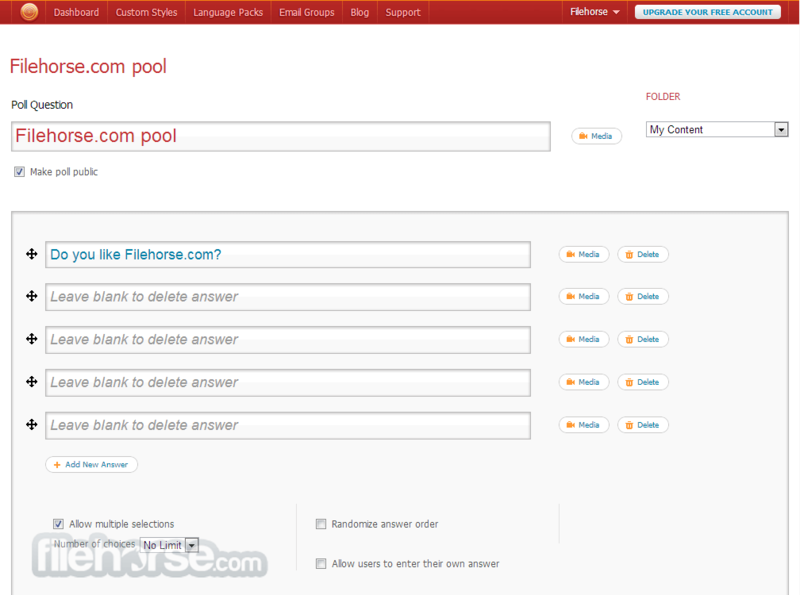 Pools created with Polldaddy are very visually attractive, and have full support for customization to the deepest levels, including the ability to organize content how you like, use CSS to change every element of your poll (font sizes, colors, images, videos, HTML formatting…) and much more. However, visuals are the least important thing to businesses who want to use polls to gauge the interests of their user base. Amazing online survey software! In addition to polls, this service can also manage surveys, quizzes ratings, receive incredibly detailed reporting and report data filtering, service integration into all modern portable devices (suchas iPad, iPhone, iPod Touch, Android), sharing of results with team members, multi-language support, automatic SSL security, full CSS access for deep customization, poll/survey date or user group restrictions, full support for WordPress embedding, export of results to all popular business data editing or viewing programs (Excel, XML, PDF, Google Docs), and ability to embed not only your text and images, but also Video content from YouTube, interactive Google maps, Flickr images and more. Interface of Polldaddy is very professional and easy to use, with main site, dashboard and management tools that are quickly accessible to be used no matter what your task is. After just a few minutes with this service, even the novices will have no problems to create and publish their first data collecting project, while at the same time, professionals will immediately locate tools for deeper customization and management. 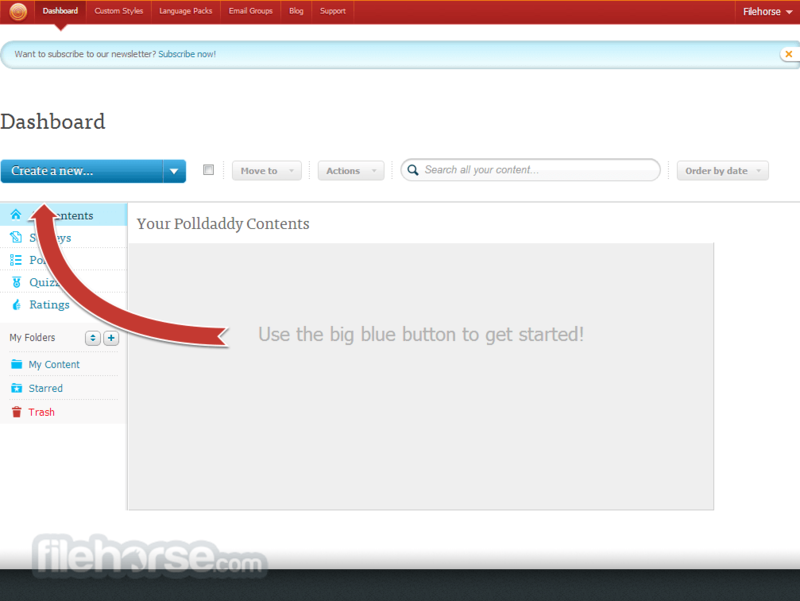 Free version of Polldaddy is highly usable, allowing one user to access really high amount of useful tools and services. However even that generous free offer is just a base that will not be attractive to professionals. 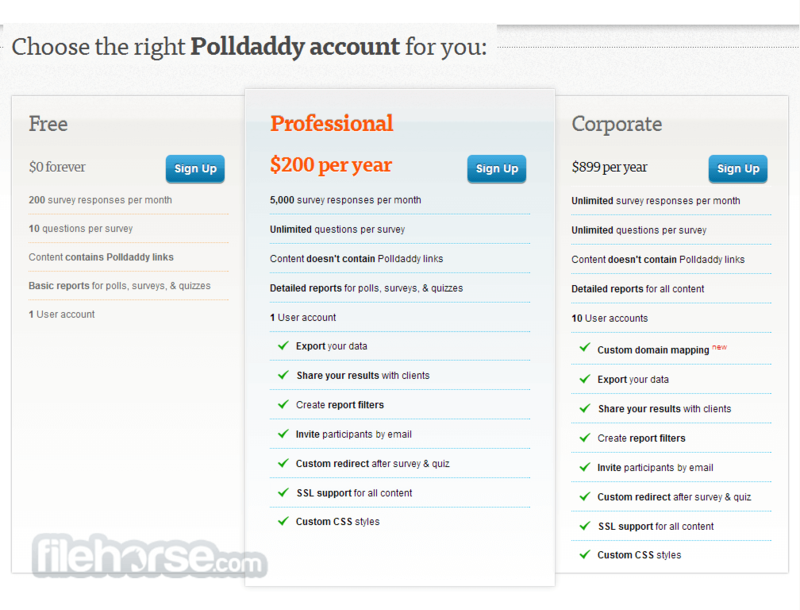 For them Polldaddy offers premium tiers that starts with $200/year for “Pro” package and ends with $899/year tier for “Corporate” package. If you are willing to explore Polldaddy and its tool chain, you can quickly find out that there is nothing that this popular webapp can’t do. It’s fast, intuitive, easy to manage by novices and fully customizable for use by professionals. Use the survey editor to create surveys quickly and easily. 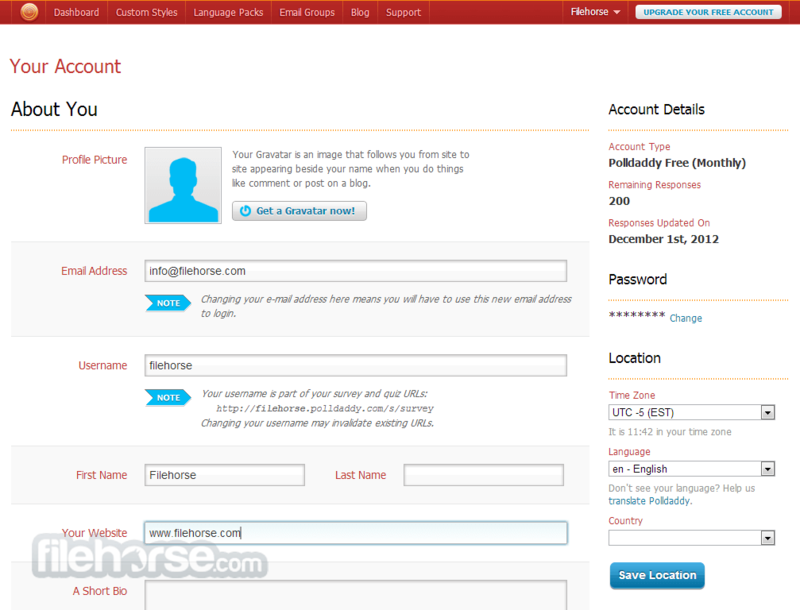 Collect responses via your website, e-mail or on your iPad or iPhone. Amazing online survey software! What does your audience think? Embed simple, one-question polls into your website to find out. The perfect tool for the classroom, colleagues or just for fun. Create quick and fun quizzes to test their knowledge. Create simple five-star and Nero rating widgets to attach to your blog posts, images, videos, and more.